Click here to modify or view your existing registration. AJC Global Forum returns to Washington, D.C. in 2019 after our historic gathering in Jerusalem. AJC Global Forum is a unique policy and advocacy conference. Each year more than 2,500 people from 70+ countries convene to discuss, debate, and advocate on vital issues affecting the future of world Jewry. Experience the power of large plenary sessions featuring addresses from influential leaders, as well as smaller breakout sessions with policy experts, and meetings with diplomats and members of Congress. At AJC Global Forum, you will explore the challenges and opportunities facing Israel and the Jewish people, and make your voice heard. 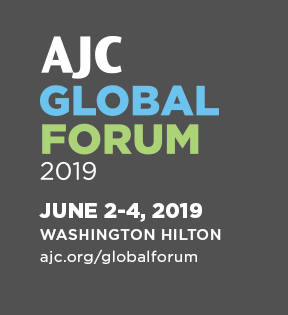 AJC Global Forum 2019 will return to Washington, D.C., with most sessions at the Washington Hilton. Click here to make your hotel reservation. AJC is the leading global Jewish advocacy organization. Through our unparalleled access to government officials, diplomats, and religious leaders, AJC works to impact opinion and policy at the highest levels. Click here for videos from AJC Global Forum 2018.